Home »Chicken Tocino 16 oz. »Chicken Tocino 16 oz. INGREDIENTS: Chicken, Sugar, Salt, Beet Powder, Sodium Tripolyphosphate, Flavoring, Spices, Citric Acid, Pineapple Juice Powder (Corn Syrup Solids & Pineapple Juice), Sodium Erythorbate, Sherry Wine Powder (Maltodextrin, Sherry Wine & Sulfur Dioxide, a preservative), Annatto Color & Sodium Nitrite. 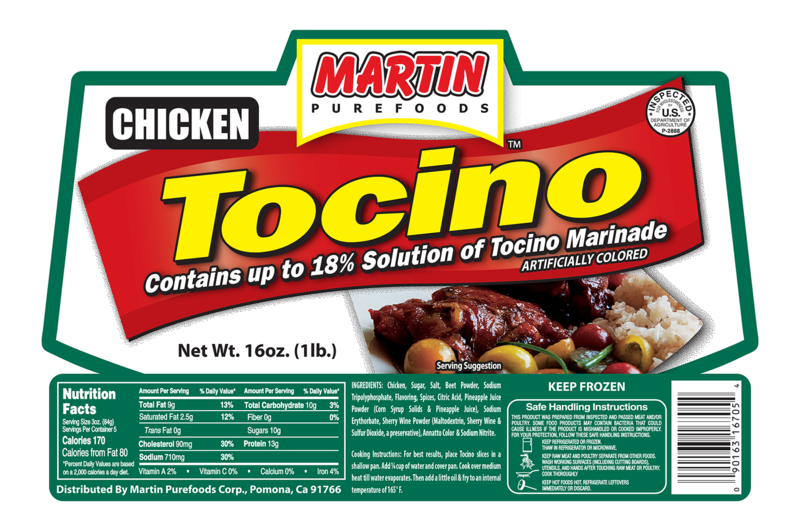 COOKING INSTRUCTIONS: For best results, place Tocino slices in a shallow pan. Add 1/4 cup of water and cover pan. Cook over medium heat till water evaporates. Then add a little oil & fry to an internal temperature of 165˚F. 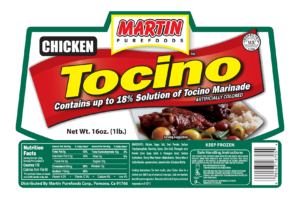 ← Previous Previous post: Chicken Tocino 16 oz.